Herb Cohen made his first pot at the age of six, and his fingers have been in clay ever since. No other medium satisfies his need ot express himself in a creative visual way. He enjoys producing functional pots that people can use in their everyday lives and decorative pots that can be enjoyed just by living with them. 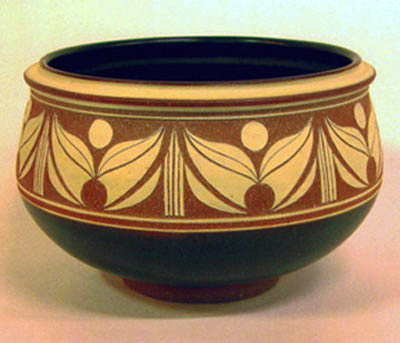 Sgrafitto, the decorative technique used on the works in his Artist of the Month show, has been employed by numerous cultures throughout the ages. A liquid clay called slip is applied to leather hard wheel thrown pots, and left to dry to the touch. The decoration is then carved through the slip layer revealing the base clay beneath. His simple elegant shapes are decorated in a manner reminiscent of the Arts and Crafts movement and a mid-century international style. His organic shapes are pared down to their simplest graceful form, and his geometric patterns have a syncopated, jazzy rhythm.